Rumors surrounding The Dark Rises like Heath Ledger appearing in Batman 3 are going around everywhere. Most recently news leaked that Batman will encounter a villain that learns his true identity, sounds like Professor Hugo Strange to me, and that Commissioner Gordon is ordered to arrest Batman. 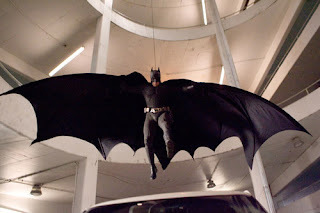 The good news is these rumors are all true, but may not be exactly true for The Dark Knight Rises. This seemingly logical plot description is actually for the video game Batman: Arkham City. Sounds like it could be the plot of the next Batman movie couldn't it? After all, The Dark Knight ended with Batman on the run from the police, who believe him responsible for murders that were committed by Two-Face. So the rumors could be true, but the only things that have been confirmed about the movie so far are the title, that The Joker and Two-Face are out, and Tom Hardy has a role. I am sure we will learn more by the time filming begins next April or the very least on July 20, 2012. Are you excited about the next Batman movie The Dark Knight Rises? Oh yes!! I'm so very excited!